We all know that the wired network connection is more reliable and faster than wireless as there will be no chances of signal loss or the risk of network hacking. But, you may not know that not all the Ethernet network cables are working similarly. Depending on the Ethernet cable type and the device to which you are connecting to it, the speed and reliability may differ. That means depending on your requirement; you need to choose a suitable networking cord. Today, I will review the best Ethernet cables for smart TV. The specifications of different networking cables are complex and mostly similar. The main things that make them distinct from each other are their speed and compatibility. So, picking up the perfect Ethernet cable for TV maybe not quite an easy task. But, you need to worry as I have done that hard work and filtered the list here. So, let’s go through it. 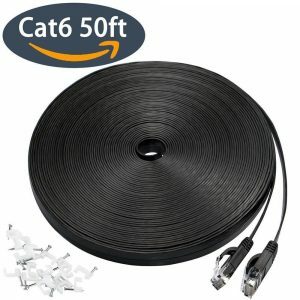 Whether you need a wired connection for smart TV at your home or office, this Category-6 network cable from AmazonBasics will not disappoint you. It is perfect for almost all kinds of needs of speeds. You can buy a single pack or multi-packs of the cable depending on your requirements. It has RJ45 connectors which mean you will get fastest and reliable speeds over your network. This cord has a length of 0.91 meters (3-foot) which is enough for your connection needs. Due to cat-6 type, it supports the speed of up to 1GB per second. 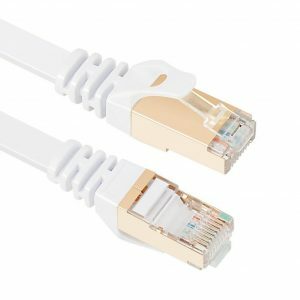 This Ethernet patch cable will deliver constant & lag free connection over your smart TV, modem, computer, printers, switches, and other networking devices. AmazonBasics provides you with a 1-year warranty for the product. 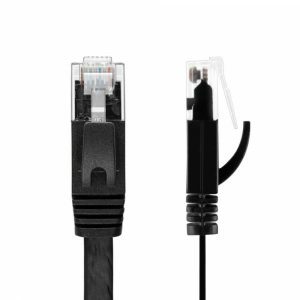 If you prefer to use flat cables, then get this cat-7 Ethernet from Jadaol. This patch cord is shielded (STP) and has a slim design which will fit in any corner or space in your home and office. You can use this cable on 10BASE-T, 100BASE-TX, 1000BASE-T/TX, and 10GBASE-T Ethernet to get frequency support of up to 600MHz and network speed of up to 10GB per second. Though it is the category-7 cord, it is compatible with the lower versions like cat-5, cat-6, cat-5e, and cat-6A. It works perfectly with the smart TV, routers, modems, hubs, gaming consoles like PlayStations, Xbox, etc. and many other devices. The cable contains four twisted copper wire shields and gold-plated RJ45 connectors at both ends for providing better signal quality. The wire has a length of 30 meters (100 feet) which is more than enough. It comes with 20 mounting cable clips to manage the cord. You will get a 90-day money back guarantee and a lifetime warranty from the company. YOREPEK provides the category-6 Ethernet cable with superior compatibility to the smart TVs of all the brands as well as to the networking components like modems, routers, hubs, switches, gaming consoles, etc. It also backwardly supports to Cat-5, Cat-5e networking wires and all types of Ethernet connectors. It is available in 50-foot size & 25-foot size. You will have a color choice from black and white. You will get constant, reliable, and high internet speed up to 10Gbps at 250MHz frequency due to its eight copper made contact pins and four twisted copper wires shields. It is RoHS compliant and LSZH-tested to make sure it is corrosion, low smoke fire resistant and long-time performer. This cable has a flat design which means you can manage it at any corner of your home and with the included 20 clips, you can arrange them well with walls or floors. Intelart offers the flat network cable for your home or office wired networking needs. The top-quality speed of this internet cable will help you to transfer the data at a tremendous rate. The cord length is 50-foot which is enough for a network setup in a spacious room. It comes with 20 mounting clips which will help you to manage the cable network easily & comfortably. 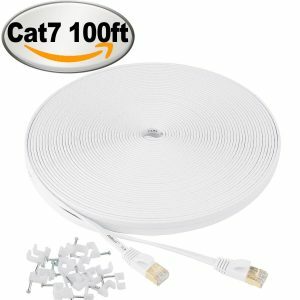 This category 7 Ethernet cable is backwardly compatible with the older versions like Cat-5, Cat-5e, Cat-6, and Cat-6A. It offers speed of up to 10Gbps at a 600MHz frequency. You will get a 30-day money back guarantee as well an 18-month warranty from the company. 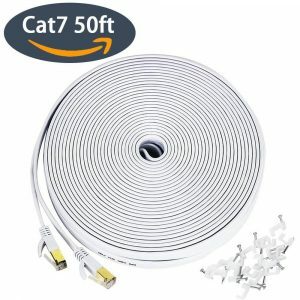 You will get a set of five Cat-6A Ethernet cables to establish an internet connection network in your office or home. The cords guarantee the safe, reliable, and secure connectivity all the time due to the molded boots, gold-plated tips, and corrosion-resistant built. You can choose from the six different sizes from 8 feet to 50 feet and three colors including blue, black, and white. It works perfectly with the smart TVs, Xbox, PlayStation, modems, routers, VOIP devices, switch boxes, etc. This network cable supports the frequency of 550MHz and speed of up to 10Gbps. It is TIA/EIA 568-C.2 Verified, and RoHS & c UL Code 444 compliant Ethernet wire. You will get a lifetime warranty on the product from the manufacturer. The slim designed, flat shaped internet network cable will fit in any device with compatible ports. You can use it with smart TVs, PlayStations, Xbox consoles, routers, hubs, modems, MacBook, and many other network components. 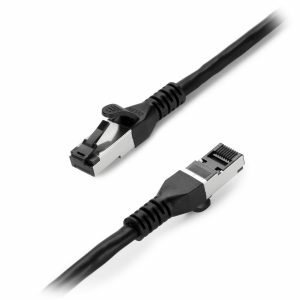 It is backwardly compatible with Category 5, Category 5e, Category 6, and Category 6A cables. It provides transfer speed of up to 10Gbps with the bandwidth of up to 600MHz. The cord length of 50 feet in enough for your networking needs. This flat patch cable will fit in any corner or space in your home and office. The RJ45 connectors with copper shields ensure that the noise, crosstalk, and interference are eliminated to provide best signal quality. Also, the data and transfer speed will be maintained thanks to the gold coating. This Ethernet is LSZH-tested to ensure the safety against corrosion and toxicity. The universal connectivity with the Snagless RJ45 Ethernet connectors makes this network cable compatible with smart TVs, desktop PCs, MacBooks, PlayStation 4, PlayStation 3, Xbox consoles, network hubs, modems, and other devices. 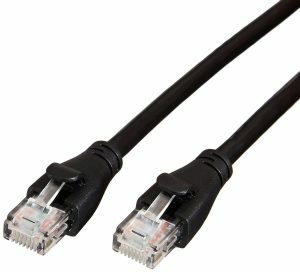 This category 6 Ethernet cord is backwardly compatible with category 5e and category 5 Ethernets. It delivers the superior performance of up to 250MHz bandwidth and 10Gbps connectivity speed. The cable length is 10-foot which is sufficient for small to medium connection needs. Four twisted pairs of unshielded copper wires are used to make this Ethernet. At both the ends, the RJ45 connectors ensure constant and reliable speed. Due to flat & slim design, this Ethernet cable is perfect for in-wall network installations too. When you buy a networking cable for your smart TV, do consider some essential things before it. First, you should check whether the cable length is enough for your installation needs or not. 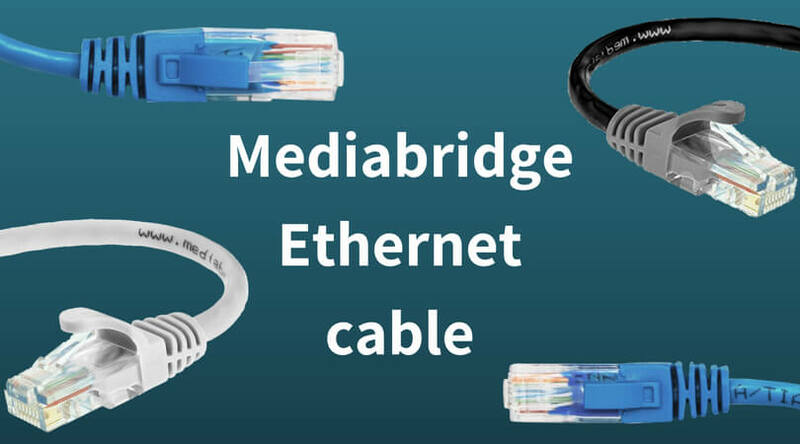 Then, check the category of the cable, in most cases, the cat6 or cat6a Ethernet is good enough to provide better transfer speeds. However, you can go for the most advanced cat7 cables too. Also, check the style of the wire as many brands today provide flat Ethernet cables for in-wall installations. Which smart TV brand are you using? Which Ethernet cable will you buy from the above list? Would you like to give any suggestions? The comment section is waiting for your inputs. Thanks!